Toys As Tools Educational Toy Reviews: Toy Fair 2014: Trend- Why "Tell" Stories? Build Them Instead! Two years ago, I thought magnetic toys were huge rip-offs. They seemed to be the bottomless pit of the toy world. Kids would tire of it easily and ask you to buy more to fill up the void. I am glad to report to you that I no longer sing that song. In fact, magnets are finding their way into so many toys and they are all so great! I dare say that it is time for these sets to become more compatible with each other so that kids can have an opportunity to try out lots of sets and use some good old fashioned cognitive flexibility to make their toys for with each other. Can you build emotion? Can you build expression? I love Geomag KOR. 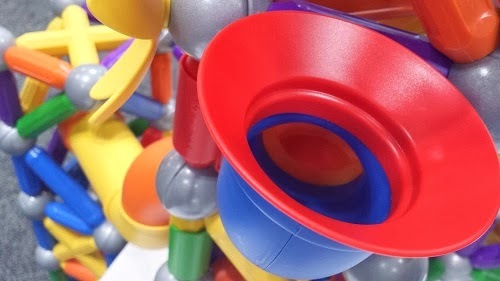 This is a concept that may be foreign to kids who are visually and spatially inclined but this toy can open a new world in understanding social communication. Ohmigosh, that green thing is soooooooooo cute. His friend is pretty awesome too. I want them ALL. ARGH! Ever find that some builder kids never build scenes of human interaction? Is that minifigure more like a garnish? Builder kids hold the key to better storytelling and other language skills everytime they play, they just need to take it one step further. Instead of asking themselves what are they making, they need to think about what is happening. Ironically, the sooner they learn to contemplate the latter question, I think, the sooner they will become better builders... of anything. The eyes are a prototype so they will be clearer when it comes out of production. But seriously, think about it. In psychologist's office, you might have 2D magnetic pieces (if at all) to help build a face to show an emotion but look what you can do here. It's 3D! If they sold all the eyes in a separate package, I would buy it, wouldn't you? What is great about magnetic toys is that they are so easy to manipulate. They can change a story way faster than a pencil and eraser. For some kids who have fumbly fingers or working memories that fly away at the end of their sentence, the ability to change things quickly gives magnetic building toys a unique super storytelling power. They still haven't decided the colors for the next models, if you have a preference, say it now! Tough guys are called Proteon. Build and Imagine. It's all magnetic. I want to see if it can fit easily with other magnetic toys. That can really encourage some inquiry-based learning. Laurie Peterson is not a novice in the toy industry who just happened to have an idea one day. No way. 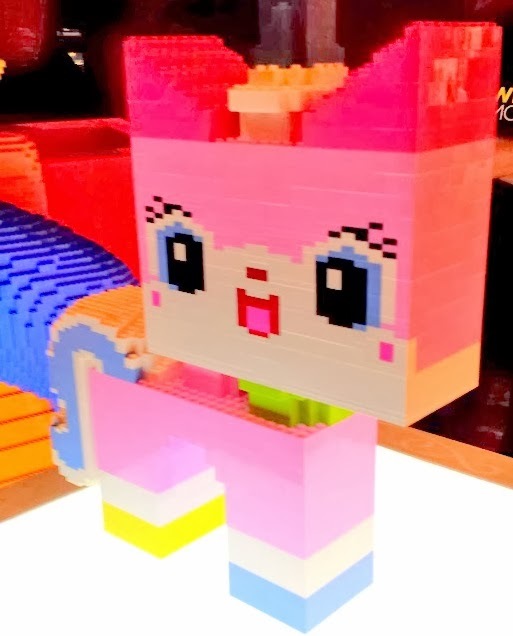 She is a pro toy person who has been working at electronic toy greats like Sifteo and Leapfrog. But now, she is on her own and creating something that her daughter can play with right now. But you know what, my son can play with this too. This is an incredible idea. .
Each panel has a scene but is also part of a geometric fixture so you are literally BUILDING A STORY. I try to teach my kids that all the time. You can liken it to a 3D-ish cartoon. Some visual thinkers can really use this to push up their ELA grades. Think of what a Build and Imagine short story would look like and then think of what an epic would look like. Smartmax has windows now. You can interchange them. I wonder if you can make a trap door. We have evil geniuses in our house. They will figure it out. One of the best things SmartMax did was to place those eyes on the cars. But I am still waiting for a human or human-like personality to inhabit the SmartMax sets. Oh, check out that tripod shape! That's new too! I don't think any magnetic toy has slides that kids can easily attach onto fixtures. We say this all the time. SmartMax is soooo smart! I have to get me a slide this year. I am only afraid that my kids will want more more more more or they may send everything we own sliding down these guys. Wouldn't it be so cool if you can make a little magnetic person who had magnetic clothing, hats, skirts, shoes, iPad, iPhone, and rode on little magnetic skateboards then slid down SmartMax's slides. I think his or her name could be... uh, Max? Oh wait, there are those toy skateboards, right? We can start with those. Read my review of SmartMax here and here and here! Read what readers wrote about comparing SmartMax and Tegu here! Read my Geomag review here!